Electric motors are designed for use in all sorts of machines. 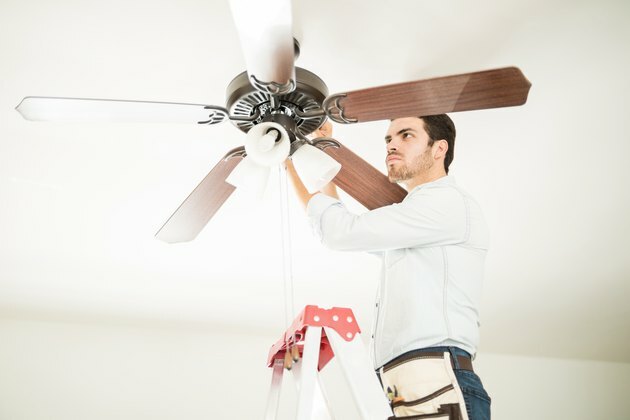 Washers, vacuum cleaners, heaters and both standing fans and ceiling fans all use them as core operating components, making them one of the more commonly replaced mechanical components in repair jobs. Electric motors come in a wide variety of configurations and power ratings, whether they operate at 40 volts, 115 volts or 450 volts. Of all these motor types, the two-speed AC motor can be one of the more puzzling ones to wire up for safe use, particularly if you're unfamiliar with electric motors. These motors possess three colored wires – most commonly, these wires will be red, black and white – which allow the motor to operate at different speeds or rates of power depending on how power is applied. In conjunction with a three-pole toggle switch, a two-speed electric motor can easily be switched between its output levels. Wiring the motor isn't too difficult as long as you pay attention and be careful. Today, most electric motors used in consumer appliances use alternating current (abbreviated AC) and are referred to as AC motors. AC electric motors convert electrical energy into mechanical energy through the use of electromagnets and electrical current that alternates its flow direction periodically, allowing the appliance to function on a variable amount of electricity. One of the advantages that comes with this design is the ability for an AC motor to operate at a variety of speeds based on the electrical voltage supplied to the motor or which electromagnetic coil is powered on at a given time. These output settings are linked to the white, red and black wires coming out of the motor. Before attempting to wire up a two-speed electric motor, it's crucial to understand what the three colored wires are connected to. The white, red and black wires in an electric AC motor supply power to the motor itself and determine which of the speed coils turn on when electricity is supplied. In almost every motor design, the white wire will be the neutral. Regardless of output setting, power will be applied to this wire. The red and black wires, in contrast, have power applied depending on the output desired of the motor. When power is applied to one of these colored wires in addition to the white wire, the motor will operate at the output linked to whichever color is receiving power. The black wire is most often linked to the high-speed coil, whereas red is generally linked to the low-speed coil. Motors with additional output rates may also include blue wires that are tied to a medium output setting. While it is possible to rewire an electric motor every time you wish to change the output rate, it is far more convenient and much safer to connect your motor's wires to a switch. A three-pole toggle switch will allow easy selection of motor output. To wire your motor to the switch, first ensure that no electricity is flowing from the power source or that your polarized (two-pronged) plug is not connected to a power outlet, depending on your system. If your motor is being connected to a power source via a grounded cable, use a wire splitter to connect the cable to the white wire and the center terminal of your switch. If using a polarized plug, connect the wire linked to the large prong to the center terminal of the switch and the smaller prong's wire to the white wire. Then, connect the red wire to the right-switch terminal and the black wire to the left-switch terminal. Once you've finished securing the wires, restore power to the source or insert your plug into a power outlet. You will then be able to use the toggle switch to quickly and safely select your desired motor output. What Is the Function of a Switchboard?